A cat somehow managed to get its head stuck in the grille of a car in Ireland and went on a dangerous ride along the highway before being saved. 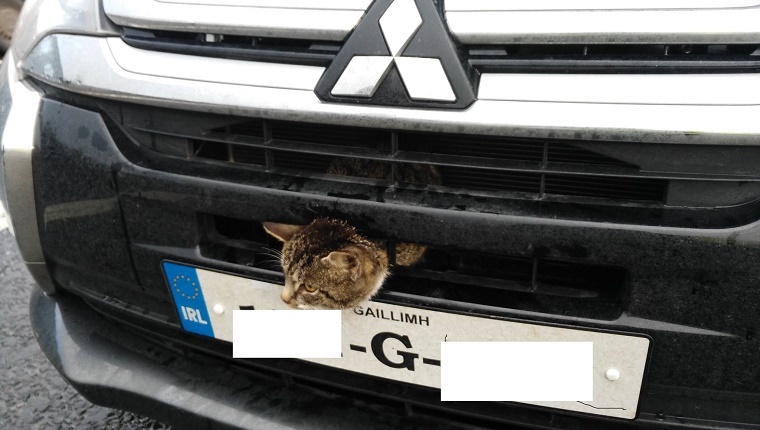 Luckily, the cat was only in this predicament for a few miles when a concerned Garda–Irish state police–motorcyclist pulled the car over. The driver thought he was being pulled over for speeding, but the officer saw the cat in the grille and knew he had to act. After the car was pulled over, the officer went about dismantling the grille to get the cat free. The frightened feline was not injured. It’s lucky that the driver was pulled over before he managed to drive very far, as he still had a long way to go on the highway and had no idea that the cat was there. Thanks to the sharp eyes of the officer, this cat was freed and, hopefully, won’t be hiding in any more cars from now on. What would you do if you saw someone driving with a cat in the grille of their car? Let us know in the comments below!